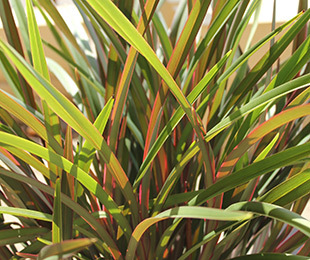 Description: Ruby Green™ Dianella has green to bronzed coloured leaves and a distinctive red coloured tinge to the edge of the leaf. It will display red tinged foliage through autumn, winter and spring but will become less noticeable through the summer to cope with the heat. An attractive Dianella with a clumping habit, Ruby Green flowers in early to mid October. It has the ability to cope with dry periods, heat, frost and humidity. Size: 60cm high x 40-50cm wide. 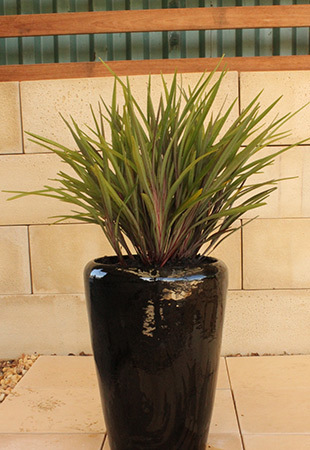 Uses: Ideal for group plantings, border plantings and general home garden use. Position: Full sun to part shade. Sandy to well drained clay soils. Care: Water as required for 8-13 weeks until established, then water as required. Plant in a well mulched garden (chunky mulch is recommended). Use slow release fertiliser in spring.Remove older leaves as necessary.